Matthew Mason (NZL) brings a wealth of experience to the team, not only as a sailor but as a boatbuilder and shore team all-rounder. 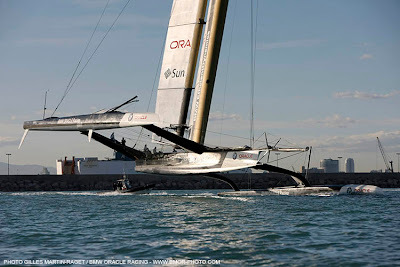 This is his sixth America's Cup and he has ties to Russell Coutts dating back to Team New Zealand days back in the 90's and skipper Jimmy Spithill from the OneWorld campaign in 2003. 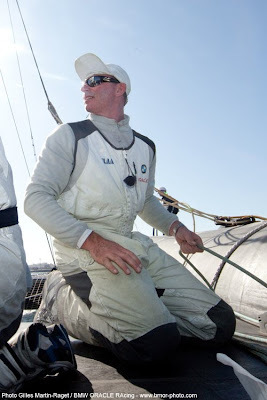 Prior to that, Matt also sailed in the Whitbread Round the World Race in 1993-94. "I've been sailing since I was about eight years old," he says. 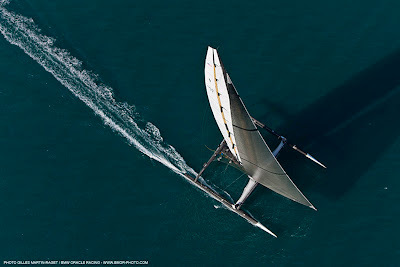 "I started in New Zealand sailing P-Class and came up through the other junior classes. Then I left school and did a boatbuilding apprenticeship. I kept at the sailing, not professionally, but my job just led me to the water a lot and I started sailing full-time when I was about 21. "I first realised I could earn a living at it around the early 90s. It was still pretty hard back then, but I was lucky enough to be involved in the '92 AC for New Zealand and then in 1995 in San Diego as well. It was around then when you could make a reasonable living at it. Well, almost," he laughs. 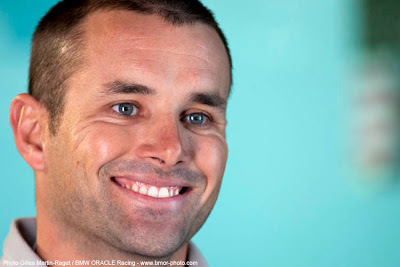 Matt came to the BMW ORACLE Racing team relatively late, and counts his service in terms of weeks, not months or years. "I haven't been involved very long," he admits. "I was lucky enough to be invited to San Diego in September to help do some deck layout changes and one thing led to another. It was going to be a three month stint and I'm still here now. "On shore I run the boat - they call me the boat director - which involves overseeing the whole boat operation. We have had so many things going on, and that branches out to the wing sail as well. 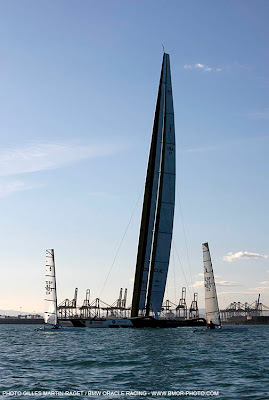 "Now, since we've been in Valencia I've started to do quite a bit of sailing with the guys. And just over the last week or so, I've been asked to join the sailing team, so it looks like I might be lucky enough to be racing in the upcoming Match. I feel very privileged to be sailing on board with the guys. It's an incredible boat and really something special. "It was only six weeks ago or so when I sailed on the boat for the first time," Mason says. "It was breathtaking to be ripping along at 20 knots or more in almost no wind and the main hull lifts out and everything just goes silent. 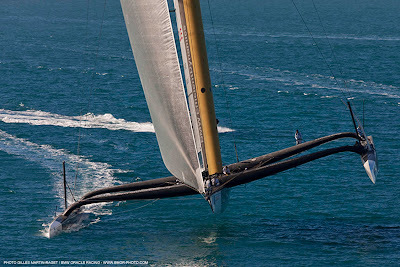 The leeward hull slices through the water…amazing." 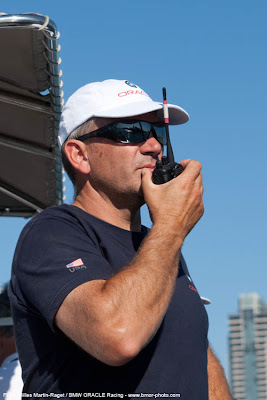 Sailing team coach Glenn Ashby (AUS) talks about the day on the water over on the main team website. Photographer Gilles Martin-Raget wasn't alone in that chopper. Our TV production unit led by John von Seeburg was with him. Here's a taste. Good breeze today and the sailing team is taking full advantage of it. Off the mooring at 08:30, they still haven't returned as of late afternoon. Our photography team was taking advantage of the conditions as well, getting in a helicopter this morning. Below are the - as usual - stunning results. 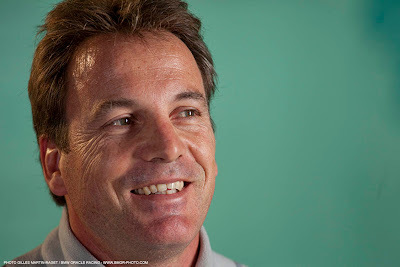 Thierry Fouchier (FRA) is one of the more experienced multihull sailors on the team, having spent time sailing with Franck Cammas on his Groupama trimarans. 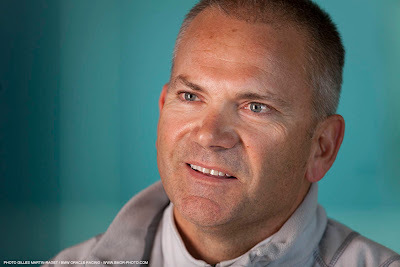 But he also has America's Cup pedigree - he was with the French team in 1999-2000 and sailed with the Swedish Victory Challenge in the last Cup. "My first main achievement was being part of the Corum Sailing team in 1991 when we won the Admirals Cup," Fouchier says. 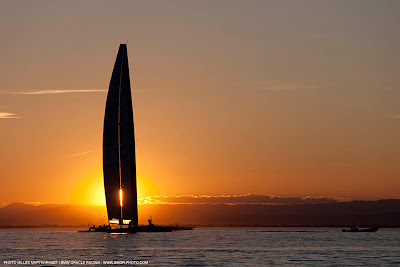 "Then I switched to match racing with some French skippers like Thierry Peponnet and Bertrand Pace. I ended up doing the America's Cup in 2000 in Auckland. 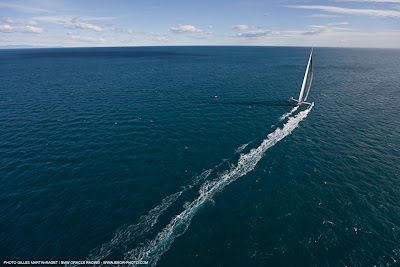 I switched to multihulls and sailed with Franck Cammas on Groupama I and II. 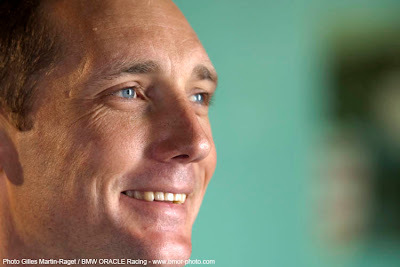 In 2007 I was with Victory Challenge and then I joined BMW ORACLE Racing two years ago." His sailing background as a youngster is slightly different from that of his peers; he started directly on big boats, while many of the other sailors on the team began sailing dinghies. What he shares with many of his teammates is a supportive family. "The biggest influence for me was my father. He wasn't sailing as a professional but he was sailing every weekend in Marseille and I would look at him and think, 'I want to do that'. 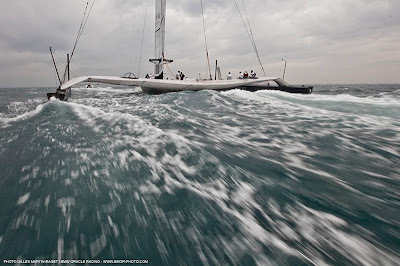 And I've been able take it another level and sail professionally." 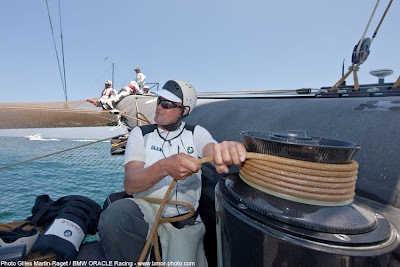 On board the USA, Thierry sails in the aft pit, which puts him in the middle of the action. "Aft pit role means you have to work with many people on board," he explains. "I work with Joey Newton (AUS), when he does the runners, and with Simone de Mari (ITA) and also with Matteo Plazzi (ITA) the navigator, who works close to me. 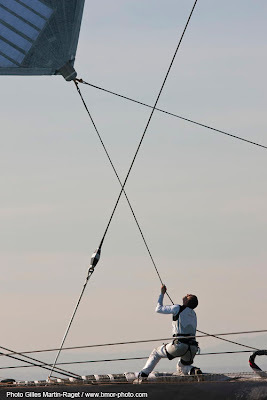 I run the 'uppers', holding the mast at the top and am in charge of some of the hydraulics." When asked for his highlight of the campaign so far, he demurs, saying it hasn't happened...yet! "I think the best part is about to come in two weeks. It's been a long campaign, very complicated, but we've made some big achievements together with this boat… I can't tell you what it would feel like to win yet - but hopefully I'll tell you in a couple of weeks!" 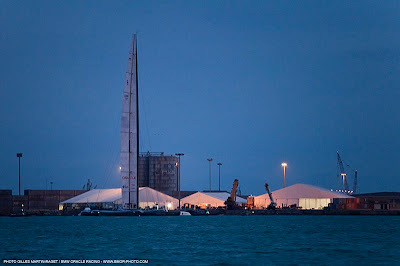 Friday's session started later in the day and continued until evening, with the boat not returning to port until after sunset. 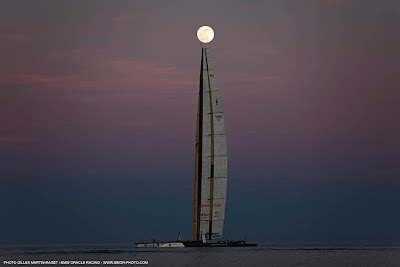 And as usual, team snapper GMR had some great shots today, beginning with when a couple of A-Class catamarans came to visit, all the way through a spectacular sunset and moonrise at the end of the day. 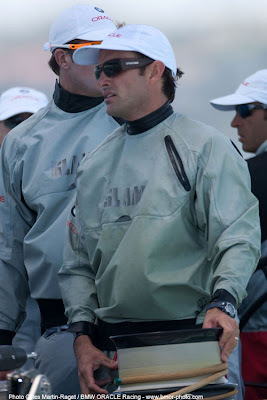 There aren't many sailors who can claim to be on their fourth America's Cup campaign whilst still in their early thirties, but Joe Newton (AUS) is one of them. 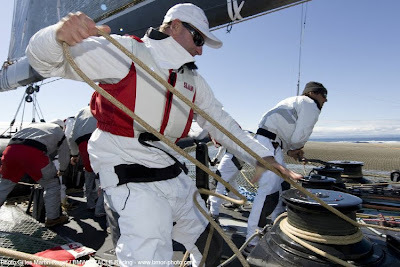 Getting an early start with Syd Fischer's Young Australia team in the 1999-2000 Cup in Auckland, Newton has never left the scene, moving in lockstep with James Spithill through the OneWorld (02-03) and Luna Rossa (04-07) campaigns. "I've known Jimmy for a long time," he says. "We started racing against each other at around 18 or 19 in youth match racing between the two different states we lived in. 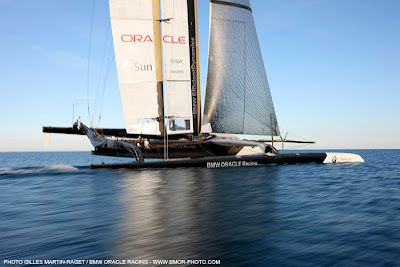 Then, at one point, Jimmy had to go do an match race regatta overseas in Italy and asked me to go and crew for him and we've done a lot of match racing together since then, including the last four America's Cups." 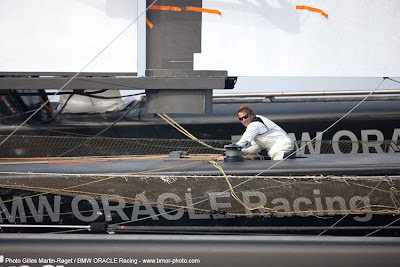 On board, Newton usually works closely with Spithill. As a trimmer in the last three Cups, he was responsible for the power and trim of the boat. Now, with the wing sail, that role has evolved slightly. "My role is wing sail caddy. Normally I'm a trimmer on an AC boat and so that led into helping out with the wing sail trimming. I help out Dirk de Ridder with the main sail - in this case, the wing sail - trimming and do a lot of other small jobs around the boat as well. I also help out Rosco with the headsail trimming, being his offside trimmer and trim the runner when we're sailing upwind. 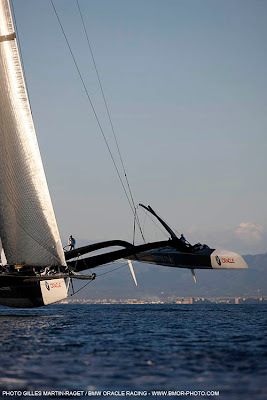 "The wing sail is completely different. It's like nothing we've ever seen. We sailed a lot on the C-Class boats in Canada and got an idea of the concept. But until you get to the scale of the wing sail we're using, you really have no idea of what it's going to be like. It's an amazing bit of engineering to go out and use. It's a simple way to go sailing. Once it's up and sailing in the boat, it's much easier (than a soft sail) to get a really good level of performance out of it." It's a long way from youth sailing in Australia in Sabots, 420s and Lasers. "My father was the one who got me into it and encouraged me and supported it. It's can be an expensive sport when you're trying to sail at a competitive level so I'm indebted to my family for that support." What's been the best part of the past three years? 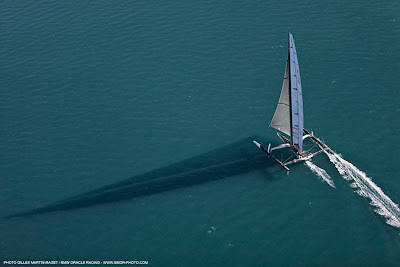 I think probably just a couple of days ago, screaming around in 22 knots of breeze with the wing sail up. It's an amazing boat and you feel pretty privileged to be able to sail on it. I can't imagine anything like this being built again for very a long time, so we're all extremely lucky to be able to sail on it." 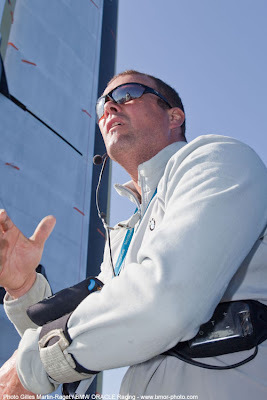 Trimmer Ross Halcrow (NZL) - 'Rosco' - has won both the America's Cup and the Volvo Ocean Race and is considered among the best in the business at what he does. A lifelong sailor, he started early, with cruises on the family boat. "I started sailing when I was four years old, cruising with my parents on a 34-foot sloop in New Zealand. 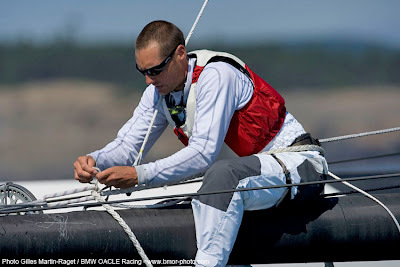 I started racing my own dinghy when I was eight years old and started progressing throughout he ranks in NZ." His big boat sailing career started almost accidentally, when he was in Perth, Australia for his day job making sails at the 1987 America's Cup. 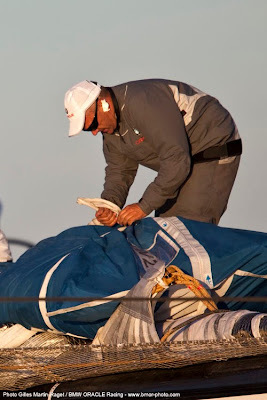 "I was there as a sailmaker and did quite a bit of sailing on the 12 metres," he explains. "I started sailing on the boats when they were short on numbers." And realising he could fit in well with the crew, that's when he realised he could possibly be a Whitbread and an America's Cup sailor. 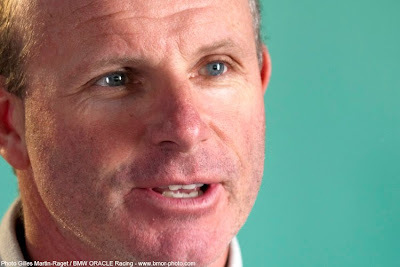 "I raced around the world in the 1989-90 Whitbread with Fisher & Paykel, finishing second, and did the 1992 America's Cup with the New Zealand Challenge. 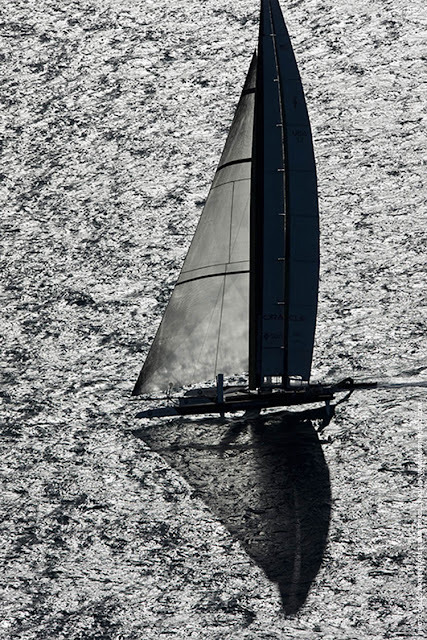 In the 1995 Cup I was the downwind trimmer for Team New Zealand when we won." 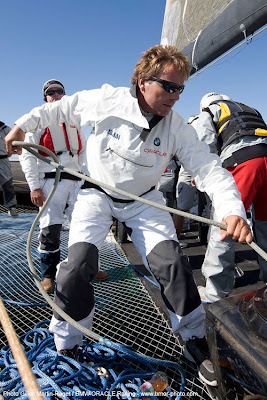 Since then, he's sailed in the Cup with Young America and BMW ORACLE Racing and won the Volvo Ocean Race with illbruck in 2001. Along the way, he's gathered up six world championship titles in various classes as well. Now, he's learning how to transfer those skills to a multihull. "This boat is far different from anything else we've sailed," he says. 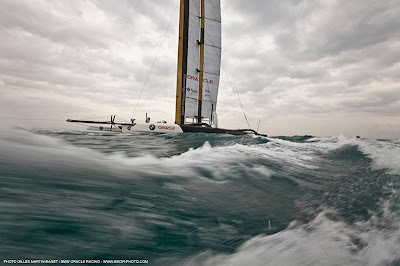 "It's a whole new discipline of sailing. This is in a category by itself. It's a whole lot faster for one thing! But we've been able to get up to speed with it really quickly. I think we're all very happy with the boat and the wing sail. 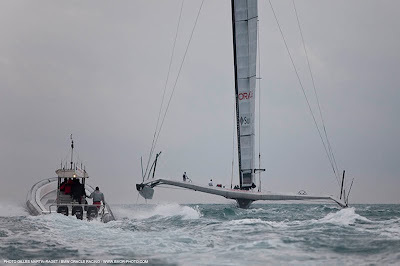 The boat is way more manoeuvrable, easier to tack and gybe." With the first race now less than two weeks a way, Rosco says he's looking forward to racing. That's the thing that he's missed out on most during the campaign so far. "It's been a while since I've done a race and that's what I do - I race sailboats - so I'm looking forward to the competition," he says. "That's what it's all about. 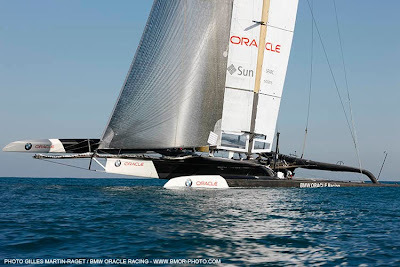 That's going to be the beauty of this America's Cup. We have some kind of an idea as to how fast they are, and they have an idea as to how fast we are but until the start gun goes and we line up for the first time and get going, we're not really going to know. It's going to be pretty exciting." 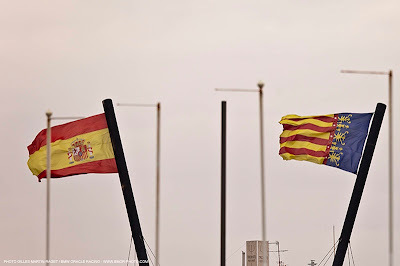 It's been 'breeze on' for a couple of days now in Valencia and while the winds have eased from earlier in the day, they are forecast to return, to some extent, tomorrow. 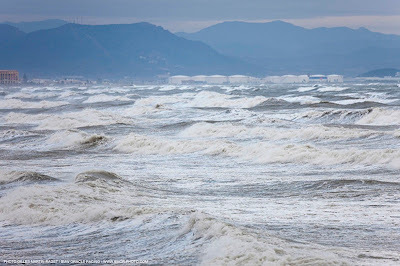 Better sailing conditions are promised for later in the week. 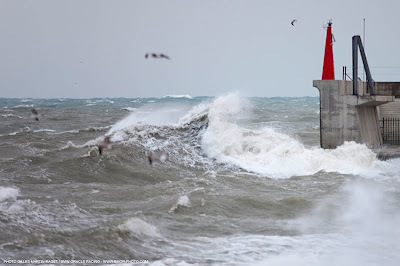 Gilles Martin-Raget ventured out earlier today when the wind was up and captured these shots. For our friends in France. 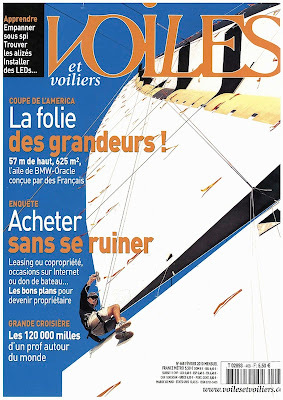 Voiles et Voiliers, a great French sailing magazine, features a cover shot of the wing sail, as well as eight full pages of coverage on the team in its latest issue. 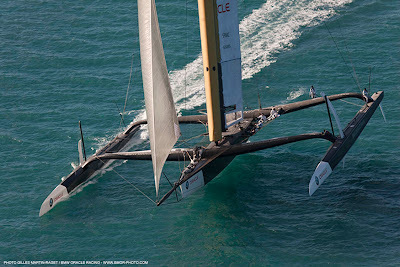 And the magazine's website has an interview with skipper James Spithill as well as many of the French members of our team. 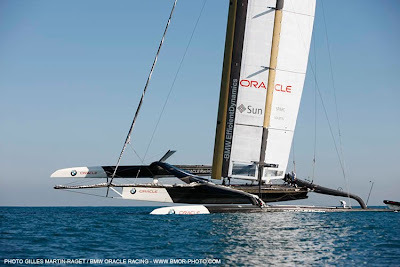 Bowman Brad Webb (NZL) is one of the originals here, working with the team since it was founded by Larry Ellison as Oracle Racing following the 2000 America's Cup. "I've been here for three campaigns now...a long time. I'm waiting for my gold watch," he jokes. As with many Kiwis, he grew up with sailing, starting in the P-Class dinghy and eventually graduating to big boats. "I went overseas and was lucky enough to catch on with TAG Heuer with Chris Dickson in 1995," he says. And he's never looked back, being involved in every America's Cup since. 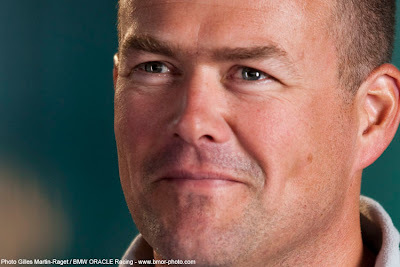 The current BMW ORACLE Racing team unites Webb with Alan Smith, a fellow Kiwi who served as inspiration for a young Webb. "Initially I watched the America's Cup in 1992, when I was still in school, and even back then I was pretty sure I wanted to be a bowman. The bowman for New Zealand (at the time) was Alan Smith, who is with our team this time as well. As I developed in my career, he would be at the same regattas I was and I just kept watching what he did. I didn't try to invent anything, I just tried to do what he did." So why the bowman role? "I like the activity of being a bowman," Webb explains. "You're always busy; there's always something going on. I like the pressure of the start line; I like the pressure of top marks and bottom marks, where if you don't get things right, exactly right, you can have a very bad day. "I remember someone telling me very early on that there are only three or four positions on the boat where if you have a bad day, the entire boat has a bad day. When a helmsman, or tactician or navigator has a bad day, or when the bowman has a bad day, you really can tell." 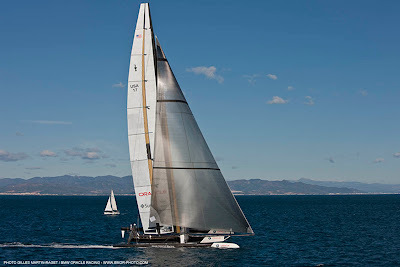 How has the bowman's job changed on this boat, a 90-foot trimaran, compared to previous Cups? "All of the gear is much bigger. 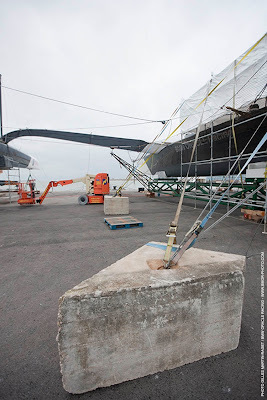 We're dealing with furling sails which we've never really dealt with in the America's Cup before and at speeds that we've never sailed at before. Dynamically, it's a very different job." And what is it going to feel like on the morning of February 8, ahead of race one? 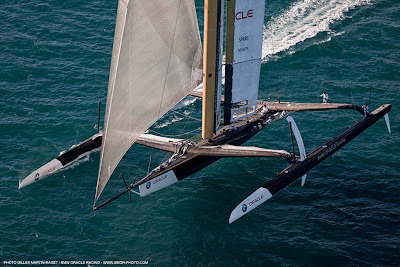 "I'm trying to think about how I'm going to be on that first morning and having never gone to the America's Cup Match, I don't really know what to expect of myself," Webb confesses. "I think that's true for a few of the guys on the boat who haven't been faced with this kind of pressure. "Everything that you've learned, everything that you've practiced, everything that you've thought about coming up to this moment is going to come to a head and you just have to go out and race." 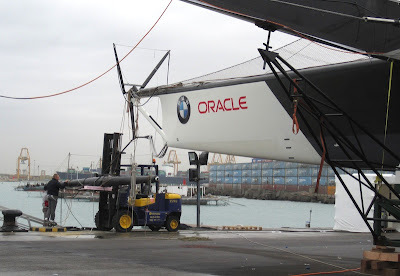 With a big weather system bringing strong winds to the Valencia area, the BMW ORACLE Racing team is taking advantage of the non-sailing days to continue its preparation of its race boat, USA. 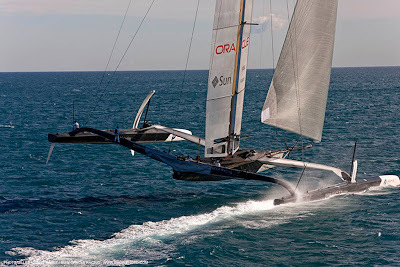 The first race of the America's Cup Match is just two weeks from today. 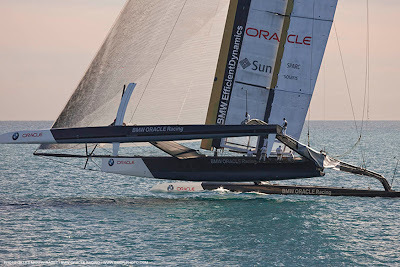 On Saturday morning, the team renewed its confidence in the boat and the wing sail when it was able to set out on its scheduled training session in winds over 20 knots. 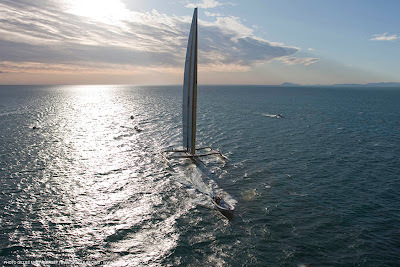 The session was shortened slightly when a trickle of water found it’s way into the yacht's electronics system and caused an electrical fault that affected the power systems on board. Over Sunday and into this week, the shore team is making sure the problem won't re-occur. "There wasn't a problem with the engine itself," explained navigator Matteo Plazzi (ITA). "Some of the waterproofing elements on board were put to a higher stress test than they had been previously and we found that areas we thought were 100% waterproof, actually weren't in these conditions. 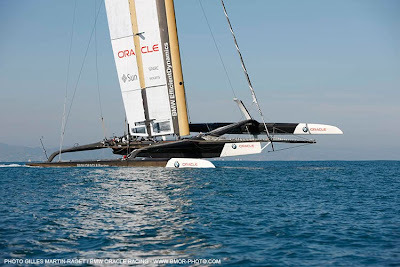 "As navigator, I know that water and electronics are not a good mix and that is what caused the failure. The engine itself was working exactly as it should. "In a strange way, it's good that it happened. It's important that we identify these problems now and eliminate them. 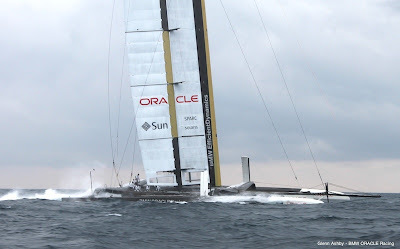 With the boats at the cutting-edge, I think reliability is going to be an issue for both teams, so the more problems we identify and take care of now, the better." 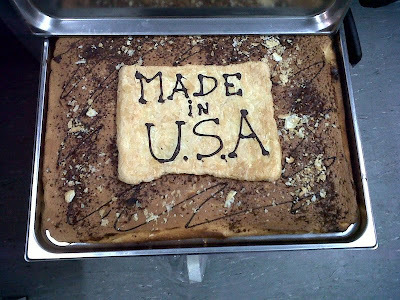 Given all the recent talk about how to make a cake and where the ingredients and baking need to happen for the 'cake' to be Swiss made, team CEO Russell Coutts(NZL) was pleasantly surprised to receive a cake this morning - a gift from the Defenders of the America's Cup. The cake - apparently made in the USA - came with candles and icing sugar from Switzerland. A humorous (and delicious) present from Alinghi. 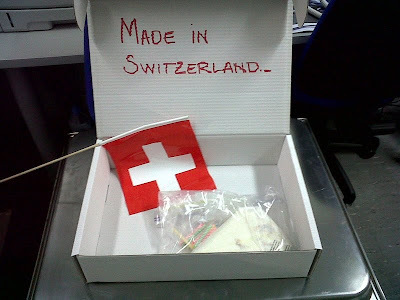 Bon appétit and merci to our Swiss friends. 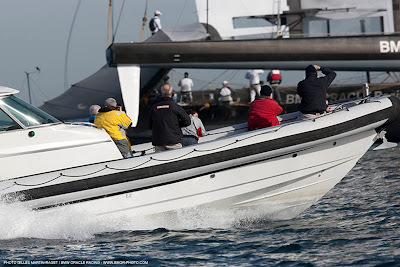 Among the many journalists in town over the past week was Matthew Sheahan from Yachting World magazine (UK). 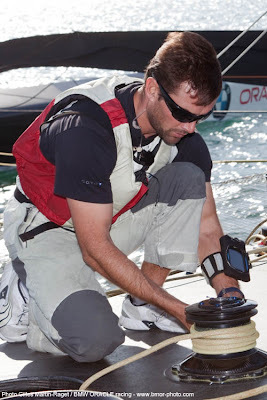 Matt is a veteran AC reporter, and covers all aspects of performance sailing for the magazine. Here's what he blogged after his visit. It was an exciting morning on the water for the team today. "We're getting more comfortable every day," confirmed Tienpont. "Today was really good because it gives us a lot of confidence in the boat." Wing in - wing up!